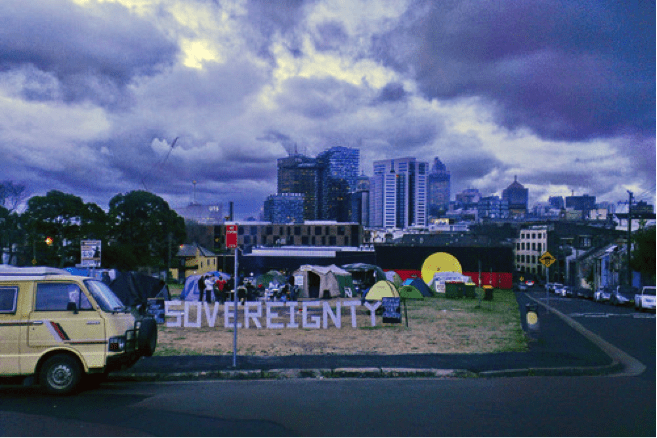 Paying a visit to the Redfern Aboriginal Tent Embassy is good for your health. I’m dead serious. From sitting around the fire and having a yarn, to playing with the kids, to free dinner and making a bunch of new friends, the community, education and inspiration of the Embassy is incomparable. Here’s how my visit on Tuesday January 6, 2015 went. After wandering into camp at about 4.30pm, I was invited into the shade of a tent to get out of the heat. I was chatting with some people staying at the Embassy and laughing at the antics of the most adorable baby, when some police from Redfern station stopped by. Apparently they had received a call from someone called ‘Amanda’ saying that Aunty Jenny (an Indigenous elder and leader of the Embassy) had been spotted here, breaching her bail conditions. Besides this information being factually incorrect, this phone call shows the constant persecution faced by the Embassy. The caller knew about Aunt Jenny’s arrest (she was assaulted by someone else on Embassy land, then arrested for it), the details of her bail conditions, and executed a calculated attempt to sabotage her before the court date. This is just a small example of the targeted attacks faced by activists fighting for Indigenous sovereignty in this country every day. After the police left, a big group of kids came racing over from the playground throwing the Embassy into chaos! All the children were photographed for an exhibition celebrating the Embassy’s one-year anniversary. After the photo shoot I explored the Embassy’s organic community garden, showing one little 4-year-old girl the different smells of lemon balm and mint herbs, and talking to the two families who were visiting all the way from Moree. When the sun set, we all sat around the fire, watching some ‘Black Comedy’ YouTube videos (which are hilarious) and the feeling of community and friendship was warming. The fact that perfect strangers are welcome for a yarn really makes the Embassy a beautiful and comfortable space. We were entreated to stay for a feed by everyone there and everyone set about helping to cook. Once the pot was set on the fire, delicious smells began wafting through the camp. Maybe this is what entices a woman walking to Redfern station to stop and take a photo. We all wave as she takes photos on her phone. Surprised, she waves back, looking unsure as we continue to beckon her over to the campfire. This is one of the things I love most about the Embassy, it welcomes anyone who is interested, even if they have no idea what the Embassy is! Tentatively, she starts to walk over to us, so I go around to show her the way into camp. “Hello,” I say as she smiles nervously at me. I explain to her that it is a camp protesting the land sales that threaten to destroy the Aboriginal community centre and land known as ‘The Block’ for high-rise apartments. “They shouldn’t sell it if there is already a community here!” She exclaims. I know I’ve found a friend. I invite her to join us for dinner, but she declines, saying it’s late and she has to go. I can’t quite remember why, but for some reason she says that she is Nepalese. “My friend is Nepalese!” I respond, and immediately start throwing out the phrases he taught me. Her entire face lights up, as she laughs, probably at my horrible accent. I gave her my phone number, in case she ever wanted to visit the Embassy, said goodbye and revelled in the wonder of how the Embassy brings people together. By 8.00pm a sausage curry was cooking on the fire, and my friend Sonia and I were put in charge of making the rice. We washed it, put it on a stove to boil and laughed at the gentle teasing about how much we were stressing over cooking it! Once the rice was done, everyone ate together at the tables like one big family. The food was filling and tasty, with plenty to go around. More visitors arrived after dinner, and suddenly the camp was filled again. Some more unsavoury characters also visited, like a woman who claimed to be, “one sixteenth Aboriginal” but couldn’t tell us her country or mob or… anything really. I soon saw that First Nations folk can sniff out a liar in 3 seconds, and the possibly intoxicated woman was asked to leave. The rest of the night we chatted with an Iranian interior designer who had two Electrical Engineering degrees, two people who came to do a night watch to protect the Embassy from attacks, some Murri boys from Brisbane and so many more! By 10.30pm it was time to head home and we said goodbye to all the friends we’d made that day. I had such a fantastic time and I made some amazing new friends that I would never have had the opportunity to meet without the Embassy. The community and family feel that you experience from a visit really puts the fire in your heart, and inspires you to more activism. Simply supporting First Nations people in claiming their land and community centre, through eating and chatting, sharing culture and making friends, is priceless. If you live in Sydney, the Redfern Aboriginal Tent Embassy is literally across the road from Redfern station, and survives off of donations and grassroots support. Pay them a visit, don’t be shy! Everyone who is respectful and willing to learn is welcome at the Embassy. In aide of the ‘Save The Kimberley’ campaign, SASEN is putting on a benefit gig here in Adelaide to raise much needed funds and awareness for the cause. 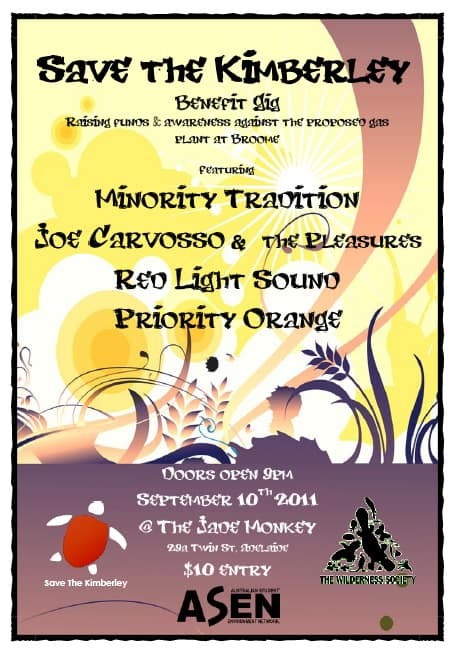 Supported by ASEN, The Wilderness Society and the Save The Kimberley campaign, its sure to be an awesome night! Since early June, the local community have been blockading the proposed gas plant site, and have weathered police violence, industrial bullies with bulldozers as well as bush fires this week. They need support from the rest of the country – this is where we come in! There will also be a petition banner to write a message & sign on the night. All funds and the banner will be taken up to Broome and presented to the members of the ‘Save The Kimberley’ campaign. There is also an opportunity for someone to join a few of us travelling up to Broome in mid September to present our banner and funds raised to the local community.